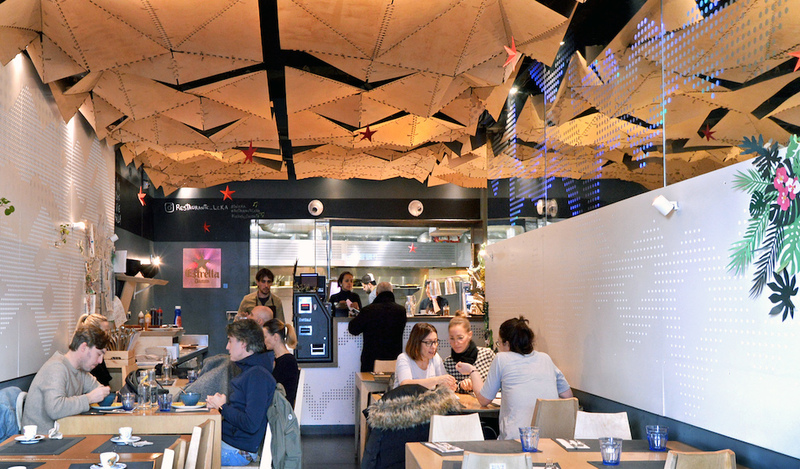 Compared to many of the contemporary restaurants and bars in Poblenou’s [email protected] district, a hub for tech companies and start-ups in Barcelona, Restaurante Leka has relatively deep roots: it first opened as a traditional truck driver’s inn and eatery in 1984. But don’t let its history fool you – this is a spot committed to the future. 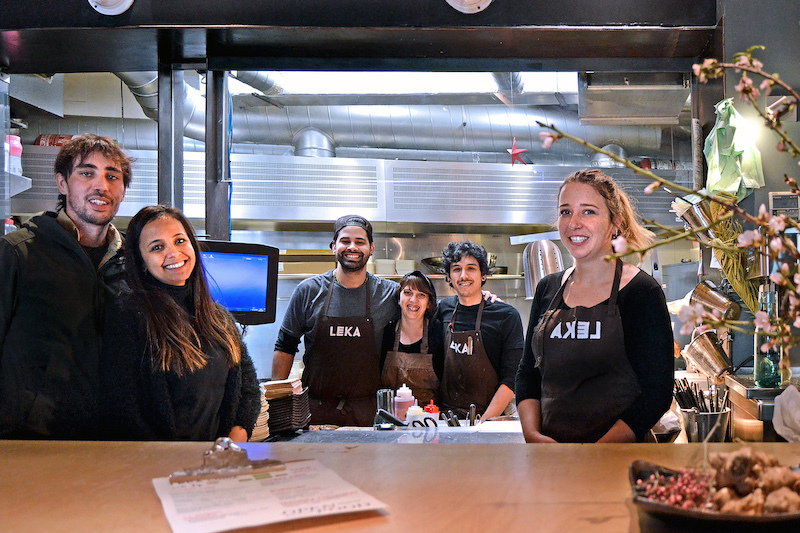 Reopened in 2016 as an “open source” and “honest food” restaurant, Leka creates high-quality and interesting dishes that combine local and tropical flavors, all at fair prices. 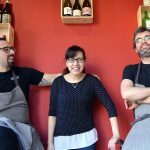 Perhaps more importantly, their culinary philosophy, which is centered on creativity, innovation, environmental responsibility and openness to the international community, mirrors the spirit that Barcelona aspires to embody. The city may be on its way, but Leka is already there. In spite of the big forward shift, the restaurant has always been and still is family-run. Lourdes Tresserras opened Leka in 1984, offering rooms and comfort food, specifically breakfast and lunch, to truck drivers and other transport workers in the area. Her son, Iván Enríquez, officially took over around 2010, when Lourdes retired, and now runs the restaurant with his wife, Arline Ares, who is originally from Venezuela and responsible for the tropical twist in the menu. “I was born here in the restaurant,” Iván explains. “My mother went into labor while she was peeling potatoes for a Spanish omelet. So I’ve spent my whole life in hospitality.” Yet the area has changed significantly from when he was a child. “Poblenou was a dark neighborhood [back then], the streets were a mess. There used to be a transport company called Gómez across the way, and people were always just passing through,” he says. The neighborhood underwent a huge transformation in 2000 with the creation of [email protected] District. The grimy streets and workshops, many of which were in a state of disrepair, were replaced by some of the most innovative buildings in Barcelona. The influx of tech, media and research companies and start-ups, as well as cultural and artistic communities, made this section of Poblenou in an attractive quarter. “A lot has changed lately, and some of these transitions were in fact very hard for us. Many businesses closed,” Iván says. New bars, coffee shops and restaurants started to pop up beside the few survivors that were able to adapt to the changing needs of the neighborhood. The end result is neither 100 percent organic nor 100 percent Km0, but rather a balance between the two concepts. When Lourdes officially retired in 2010, Iván and Arleny had already been running the family business for more than a decade – it was a relatively smooth transition. The big change came in 2014, when they decided to close the restaurant and spend some time reconsidering how to make it better. The first change they implemented was an “open source” restaurant design, a move inspired by some of their customers and neighbors who work as architects, designers and artists. One such person was Tomás Díez, the director of Fab Lab BCN, who ended up designing their adaptable modular furniture and ceiling, which resembles an organic exoskeleton. The plans for all these designs are open source, and can be accessed using QR codes found on the various pieces or on Leka’s website. The new space was opened in 2015, but it was another year before they fully executed their “honest food” concept, wherein they made the restaurant more sustainable (reducing the amount of plastic, glass and aluminum they used by 70 to 80 percent) and put more of an emphasis on the source of their food. The end result is neither 100 percent organic nor 100 percent Km0, but rather a balance between the two concepts. 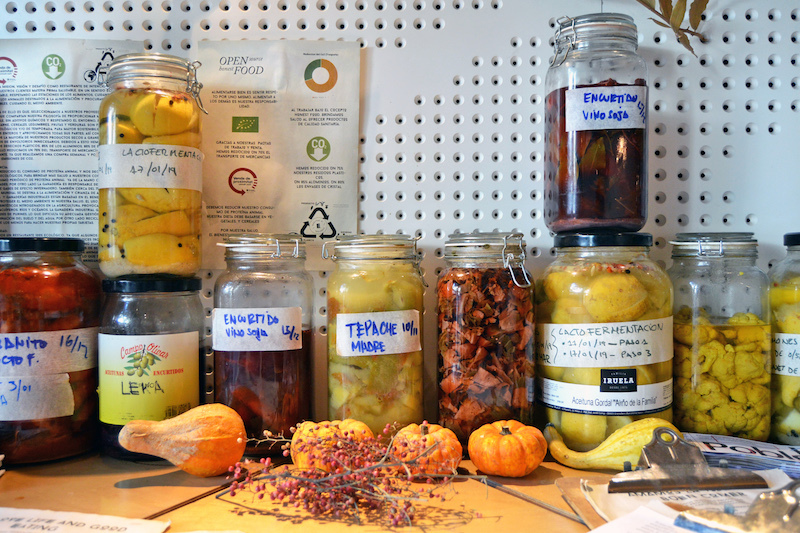 They planted their own organic vegetable garden in Valldaura, an area on the edge of the city, as part of a project promoted by the Institute of Advanced Architecture of Barcelona, and now produce their own pickles and fermented vegetables. 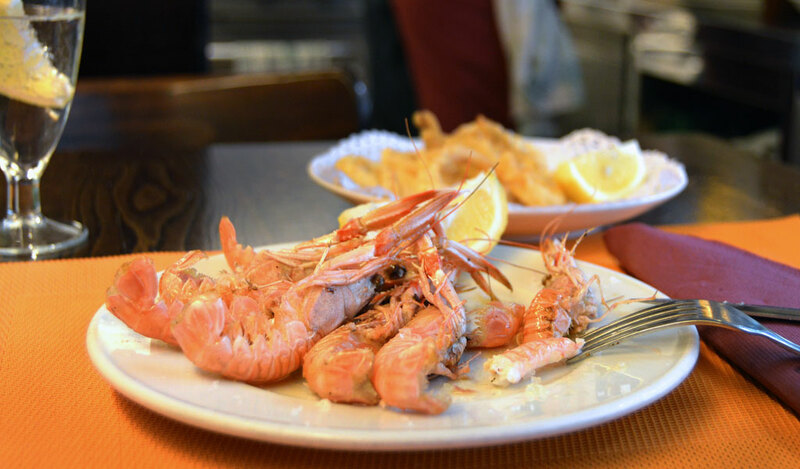 Their animal products are free range and sourced from the La Garrotxa area, and they only use locally fished seafood from either the Barcelona Fishermen’s Union (Cofraria de Pescadors de la Barceloneta) or the Delta de l’Ebre in southern Catalonia’s Tarragona region. In the case of meat, they buy whole butchered animals to optimize transport and consumption, and to decrease their overall use. Leka’s daily specials menu, which largely caters to local office workers, never features fish (although you can order it from the main menu). 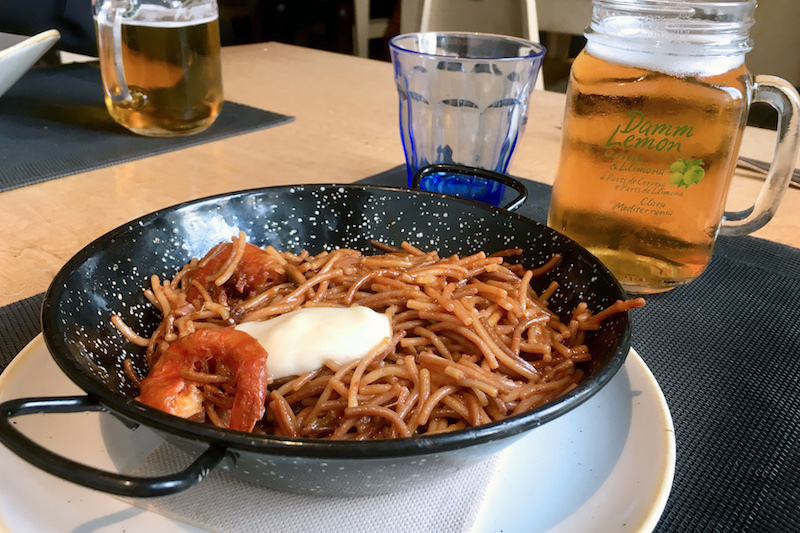 There are also no individually bottled drinks: you can order bulk wine, draft beer or house-made fruit drinks like papelón (lemon with raw cane sugar). No Coke or other industrial sodas in sight. 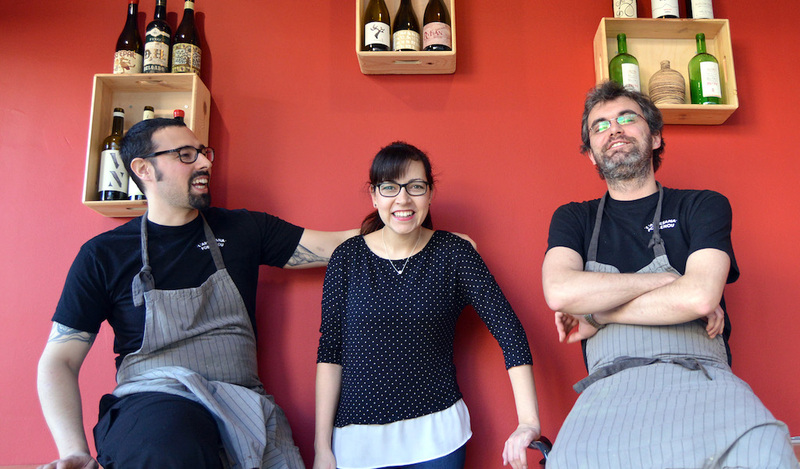 Moreover, the international kitchen team, which consists of the Peruvian head chef Mario Pérez (who worked with the Adriá brothers in Patka) and cooks Gustavo Suárez (Venezuelan) and Zhang Xialong (Chinese), work in what they call a circular hierarchy. Every week, one member of the kitchen staff chooses the daily specials menu and the others add their own personal twists. The most senior member, though, is the Catalan pastry specialist Conxi, who has worked in Leka’s kitchen since 1986 and is responsible for all the traditional local dishes like the seafood paella, the callos (spicy beef tripe stew with an intense sofrito and spice profile) and the fideuà (seafood noodles with alioli). 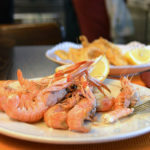 The latter was a lunch special on one of our recent visits, and we were impressed by the creamy texture and the intense seafood flavor, which came from an excellent stock. Their dishes reflect all of their personalities – a mix of local flavors like the seafood paella, the grilled octopus and the Mediterranean red shrimp with Latin-American specialties like the yucca fritter and their excellent vegan or fish ceviches. We recently had a sea bass ceviche with a wonderful and clean sea flavor that was dressed up the taste of choclo and cancha corn and surrounded with creamy sweet potato cream, in a succulent and very satisfying balance of acidic and soft flavors. The Asian influences can be seen in discreet additions such as sauces or more prominently in dishes like the Chinese-Peruvian chijaukay, which in this case is made with veal and panko instead of the traditional chicken. Looking around, it’s hard to believe that this place used to be a refuge for truckers. But even with its innovative and forward-focused concepts, the new Leka is really not so different from the old – the restaurant is still feeding the neighbors what they want.